How do tree structure and old age affect growth potential of California redwoods? Ecological Monographs 2015 Vol: 85 (2) :181-212. I use this study for some reference information but what follows are my own independent analyses and ideas. 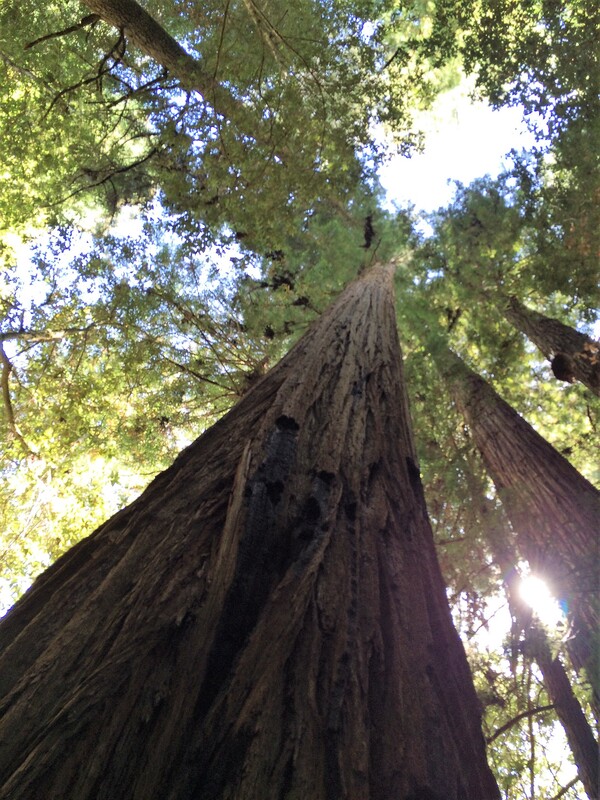 Hyperion has a very unusual feature versus other very tall redwoods in the study. About 30 meters up on the tree there are two huge branches that grow out from the trunk at near 90 degree angles for a couple meters and then turn straight upwards for twenty or so meters. Both these branches are on the same side of the trunk and together weigh about 5,000 kg. Hyperion has a volume of 550 cubic meters, of which about 140 cubic meters are above the huge branches growing out from the trunk thirty meters up. The 140 cubic meters of volume has a total weight of about 55,000 kilograms (based on Hyperion’s total mass of 210 Mg and total volume of 550 cubic meters). Therefore the upper 85 meters of Hyperion can be viewed as a 55,000 kg object with 5,000 kg of weight offset from but connected to the base. Mass dampers are used in construction and design to help stabilize vibration from external forces. For example very tall buildings will employ mass dampers to reduce sway so people do not feel sea sick in high winds as the top of the building sways. Dampers are also used in automotive engines to reduce vibration. Mass dampers add cost and complexity to structure design, and there is a trade off in materials and methods used in vibration dampening versus actual benefit. As a result typical mass dampers are set up in a counterbalance system where the damper is about 10 percent of the mass of the object being dampened. This then reduces vibration at the radial end of the vibrating object by about forty percent. For more information see Wikipedia article on Tuned mass dampers. Reviewing the redwood diagrams it is evident Hyperion redwood has very little breakage in its crown for such an old and tall redwood tree (1260 years old, 116 meters height). There is no breakage in the top part of the crown, this is one reason why Hyperion has its great height. Great location, great soil, nightly fog, and tucked into a valley for wind protection. But Hyperion has something else going for it. Those big side branches 30 meters up, with combined weight at ten percent of the trunk weight above them, serve as tuned mass dampers to reduce crown sway in high winds by about fifty percent. The unique structure of Hyperion has contributed to wind breakage suppression, allowing Hyperion to grow very tall without interruption. Looking up Hyperion’s trunk from uphill side. Hyperion’s large , low side branches are not shown in this photo. It sounds possible. There’s not scads to read about it like there are publications on pruning, planting or root growth. But even watching trees blow in wind, it’s evident it occurs at times. Observing trees leaves me guessing that branches or stems may mass-dampen during brief strong gusts like a couple seconds duration. Whereas during long gusts or steady strong winds, there canopy appears more in unison. I noticed one research report browsing the internet, so it’s on someone’s radar for study. I think you are correct – in that the additional weight of the side branches provide a dampening effect to compensate for wind, yet the increased surface area of the foliage jutting out from the trunk with its increased wind resistance cancels out the benefit of the increased mass. We have several large trees on a slope in the backyard and there was some concern about the trees coming down on our structure in the wind so we had an arborist come over and do an evaluation. He recommended removing a significant portion of the side branches to decrease wind resistance and limit the possibility of the trees blowing over. So far, so good. In the case of Hyperion, there is substantial erosion on the downhill side of the trunk due to the steep angle of the slope and soil working itself out due to rain in conjunction with the wind-related rocking back-and-forth motion over the centuries. I was reviewing the orientation of those buttresses on the Hyperion trunk in relation to the orientation of the maximum monthly winds reported from Arcata, CA. The buttresses grow on the south side of the trunk. Recall they grow straight out (actually slant down a little) and then shoot straight up. So the entire buttress is within the profile of the trunk. Then the maximum winds at nearby Arcata are almost always from due south, then if not due south then due north. So that buttress helps to slice up the south wind before it hits the trunk. Another benefit in addition to centripetal dampening, perhaps. Mark, I think Charles arborist (tree service?) may have chosen a “B” grade option for pruning, but seeing is the only way to know for sure. I’m going to post an interesting study that overlaps your blog post. The thinning method they mention toward the end is what I have been using for about 30 yrs. Oregon has many wind storms, and I found thinning to work well. They noted that other pruning like just raising the canopy actually causes more trunk bending. A damping effect was eluded to. And I’ve seen it while watching storms. Branches don’t always move in unison. Other than clearing a building roof, etc., removing concentrated chunks should be less effective than a near-equal overall thinning throughout the tree. Interesting paper. A controlled study using differing pruning techniques on mature trees then using air boat fans to push 110 mph winds against the trunks and crowns. Crown thinning, including inducing some irregularity in the branches versus uniformity, looks to work best. And good to retain lower branches to lower the center of gravity of the tree. Looks like you use similar pruning techniques there in Oregon. For such a tall tree Hyperion has a relatively low center of gravity due to big lower trunk diameter, the buttresses mid trunk, and a relatively thin crown. In the National Geographic video on You Tube covering the original tape measurement of Hyperion, Steve Sillett invokes some colorful and humorous metaphors regarding traversing Hyperion’s “spindly little crown”. That tree has a lot of structural things going for it, to help give it a clean ride all the way up to 380 feet. Raising of branches like the paper mentioned, can weaken trunks. If you noted the “lion tailing” or similar, search that term in arborist or pruning papers to understand. But when pruning, if too much is removed on the trunk side of a branch leaving most toward the end, it results in weak limbs that tweak. This is partly related to why I said solo trees are stronger than grove trees. And one more reason why I dismissed what J. M. wrote on Facebook in recent months or weeks. But if a tree can be separated from a group, it will branch all the way around and much lower. And that adds extra wood and meat on it’s bones up and down. So when it comes to pruning trees, the “Jedi” realm isn’t just knowing what to take off and how. It’s knowing when to stop and how long to wait before removing stuff. If a moderate amount is thinned, it makes the canopy porous like the paper noted. As soon as too much is removed, weakness and bending can begin. 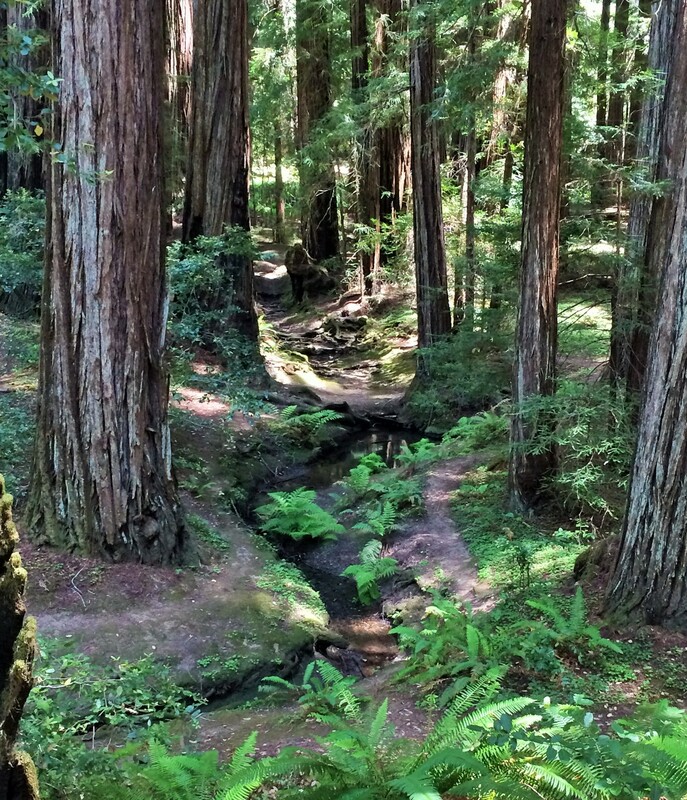 In the redwoods, many trees lose lower limbs. But it often happens very slowly over centuries and the density of the forest can reduce wind speed to compensate some.